Facebook, one of the most popular social networking sites has become a part of an individual’s life. It is like a haven for people where they can like, share and comment on any of the posts placed by their friends on the social media platform. People are highly addicted to this renowned communal location. On this popular social networking platform, one can share their bizarre moments by posting their funny images or videos just by uploading them on Facebook. It is the most trusted and most used social media platform. But now these accounts are hacked! 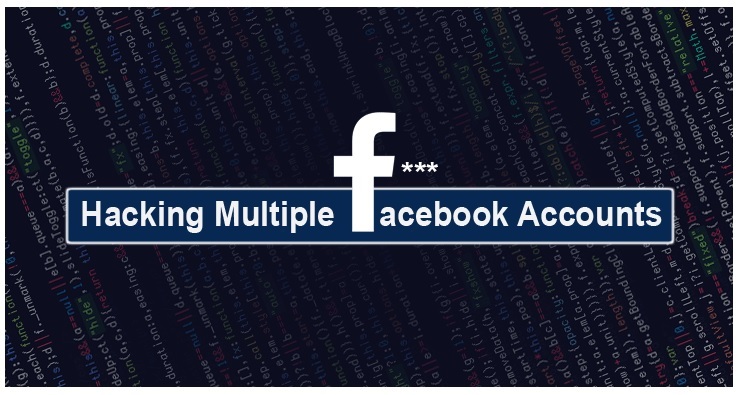 How To Hack A Facebook Account? This is most frequently asked but an unanswered question on the Internet. Hacking a Facebook account is the most tougher task. Even the kings of hacking failed in doing so. Facebook accounts are at the higher security level. But a white hacker Gurkirat Singh can easily hack your facebook account irrespective of the strength of your password. He discovered a bug in the Facebook’s reset mechanism with which he can get the access to view the message conversations, payment details etc. of other accounts. He can use that account like that of a real account holder. 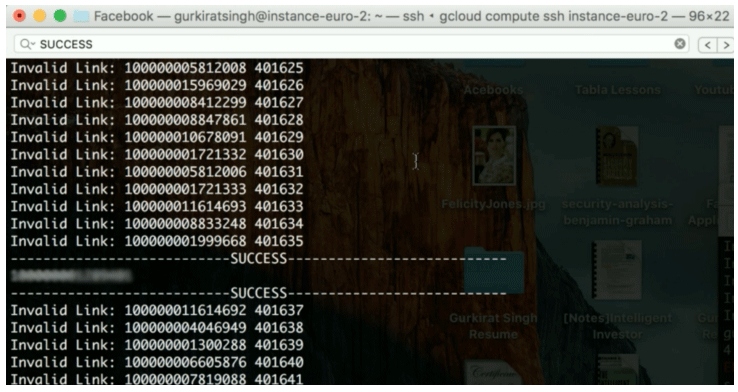 How Gurukirat Hacked Multiple Facebook Accounts? Gurkirat collected valid Facebook IDs and then visited www.facebook.com/[ID] with a valid ID number in place of [ID]. This URL automatically redirects Facebook ID to the Username. So, he was able to collect 2 Million Valid Facebook Usernames. Gurkirat then initiated the password reset requests for those 2million users (each assigned a 6digit password reset code). He did this using a script and proxies. Next, he randomly picked a 6-digit number, i.e. 338625, and started the password reset process by using a script called “brute forcing script” against all those 2 million usernames. He Practically executed this thing and found a right password reset code and username combination. In this way, he was able to hack all those accounts. Login approvals is a Two Factor Authentication system that requires you to enter a code we send to your mobile phone via text message whenever you log into Facebook from a new or unrecognized computer. Once you have entered this security code, you’ll have the option to save the device to your account so that you don’t see this challenge on future logins. #2. Turn On Login Notification Alerts. Login alerts are an extra security feature. When you turn on login alerts, we’ll send you a notification if someone tries logging into your account from a new place. Do you create a complex password whenever you sign-up for a new website account? Or do you just use a regular and easily guessable password for all your accounts? If you create same password for all your website accounts so that you could memorize it easily, then it is big benefit for the hackers to take over your account by guessing it or by using some brute-force attack. In order to safeguard your password, you need to set a strong password which is too tough to guess. So don’t worry about the hack. Follow the above tips and secure your Facebook account. Comment below if you have a problem in accessing the above tips. Best And Useful Internet hacks: Sometimes it doesn’t matter how much you are familiar with Internet and computers, the domain is too vast that there is always left something to be explored. With the increasing use of Internet, there are many things that you have learned and there is a lot more that is needed to be learned. Every now and then you come across tech tricks and hacks that you might not ever know because the Internet world is full of tech hacks that will make you say awesome. So, want to know some amazingly cool and useful Internet hacks, let’s have a look. You must be using Google Chrome for browsing but do you know you can use Google Chrome as a notepad? If you are damn busy in surfing or doing your work on the Internet and suddenly you got to write some urgent or useful information then you can check out this without wasting any single second of yours. Write down a single piece of code in the address bar of Chrome browser. This will turn current tab of Chrome as the notepad that you can use for writing purpose. Have you ever wondered about the voices of video while surfing on Internet? While working or surfing the web, opening multiple tabs doesn’t let you know from which tab sound of video or ad is coming that really irritates and annoys a lot. But the good news is you can mute the tab from where the sound is coming without closing or leaving the tab that you are currently working on. 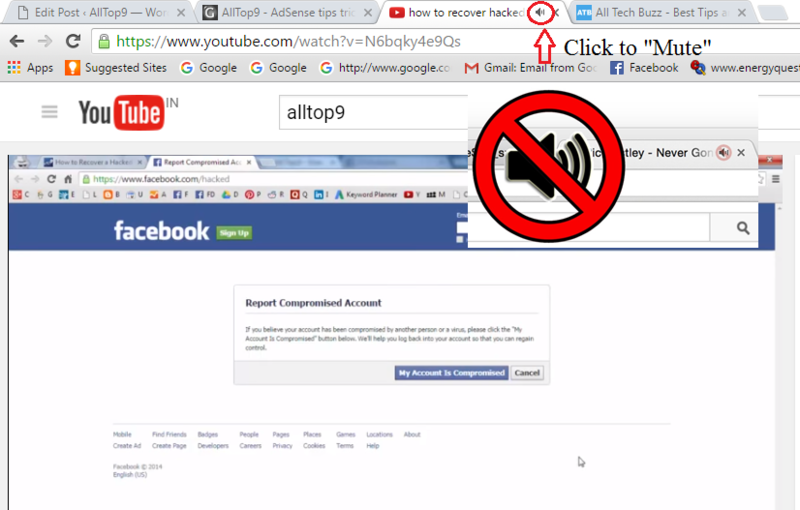 You will notice the sound icon on a tab on which the sound is coming, just click on the speaker icon on the respective tab. Google Chrome allows you to play Mp3 and movies right from the current tab. You just need to drag and drop the file that you want Chrome to play into the address bar. You must have seen how passwords are shown on any website, like dots and stars so that you can only watch out what the password is. But it is still possible to uncover the password from star shield. On the password field, right click on Inspect and open the source code window. All you need to do is change the type of the form field from password to text. You might not notice it but you keep on leaving your footprints on the internet through which any third party can track you. If you want to browse the internet without leaving any traces then this is the hack to achieve so. The different browser lets you browse secretly and offer this facility under different names. For Google Chrome, right-click and select Incognito mode while in Mozilla Firefox the same is achieved through Private Window. YouTube is one of the largest video sharing platforms that lets you watch and share thousands of videos. But have you ever wondered to change these video into animated GIF image? Having an animated GIF image means you can easily insert it into a web page or any document. The service to convert YouTube videos into gif is gifs.com that automatically do the conversion. All you need to do is to provide the URL. Convert YouTube Videos To Gif By Adding Gif Before Youtube In Url. Everyone loves music andiInternet lets you search and download your favorite music but it includes paths to reach to right downloadable link from music hosting websites. Do you know Google has served you with direct links? Yes, it is a simple trick to download Mp3 songs without looking for music downloading websites. 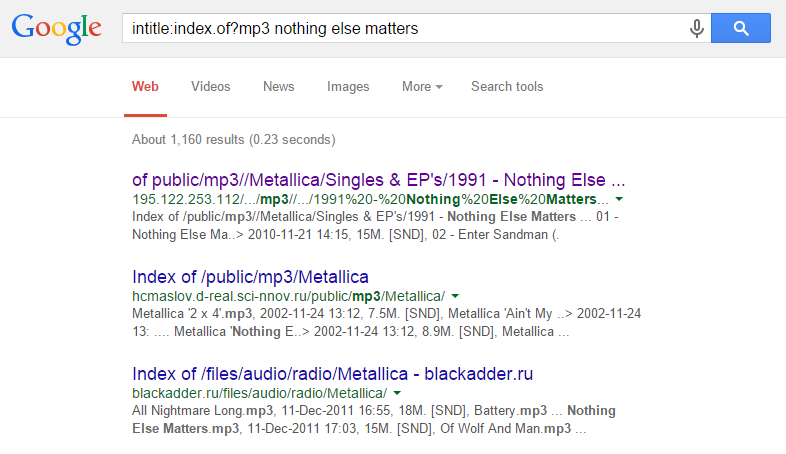 You can write any song name as song title and Google will show you all the websites that are hosting direct link. Now, with this trick downloading mp3 song will not be difficult for you. Are you annoyed with the accidental closing of tabs while surfing the web? No doubt, it happens but don’t worry there is a possibility to avoid the accidental closing of tabs. All you need to do is open your browser, right click on the open tab and select Pin Tab or Pin option. 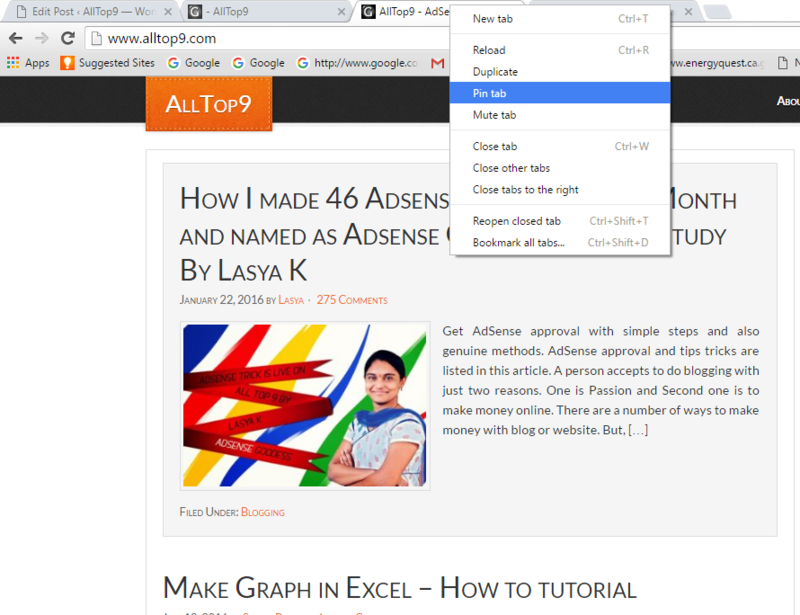 This will help you to fix the closing of tabs by mistakes and to remove this pinned tab you need to first unpin it. You can perform unpin of the tab in the same way. Does it ever happen you want to search something on Google but can’t remember the exact phrase or word? Don’t worry it is human nature and it happens with almost everyone, trying to remember particular quotes, phrase, lyrics of a song, proverb. 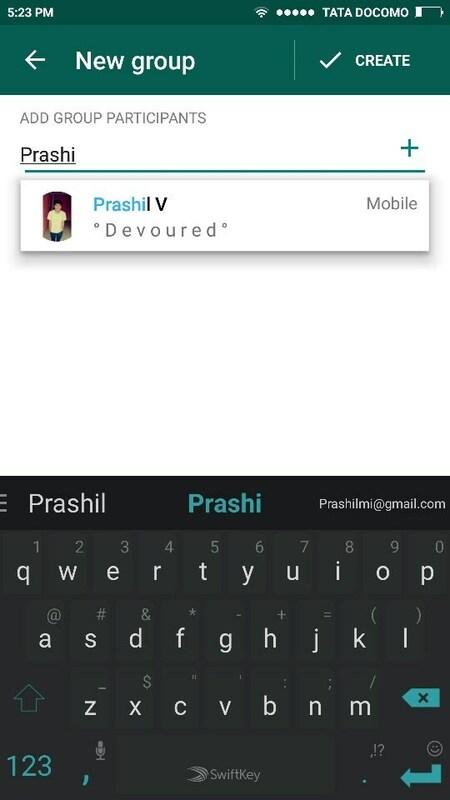 Google trick makes it easier to identify the phrases. You just need to put an asterisk in quoted statement that will indicate Google as the missing character and Google will show all the results that much likely replace the specify term keeping the rest of the words of the sentence unchanged. Sometimes due to lack of time, people want to use the mouse to drag it but there is another quicker and easier way to access address bar is the shortcut key combination. Press Ctrl+L or F6 to access address bar of your browser. Everyone knows Google is the only search engine that makes most of its profit from online advertisement programs like AdSense and AdWord. Google creates a profile for you in the database so that it could display only suitable ads for you. And thus Google only shows the ads that matches your profile. Well, Gmail includes the feature of conversation, have you ever been a part of a conversation where you have no active role to play? It happens sometimes, keep on receiving the email in despite you have any role to play. But you know what you can do for it. Just mute that particular Gmail thread and you will not receive any new email notification when any new reply made to that thread. 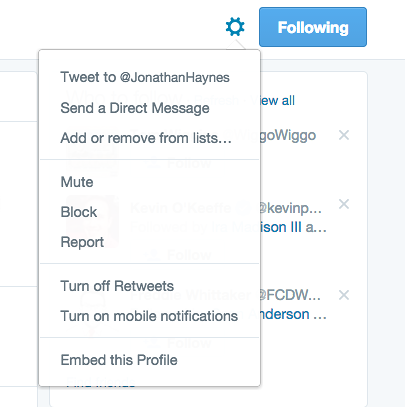 To accomplish this, go to Gmail inbox and select the particular thread that you want to mute. Under More tab, select Mute. You might have used Google Map in order to search any location from any place. But do you know Google provides the similar facility for space too? 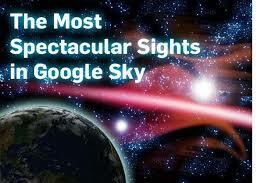 Google Sky offers the closeup view of outer space and lets you explore galaxy, constellations, planets and more. Ever checked Facebook on a friend’s or family member’s device and then realised, with horror, that you forgot to log out? 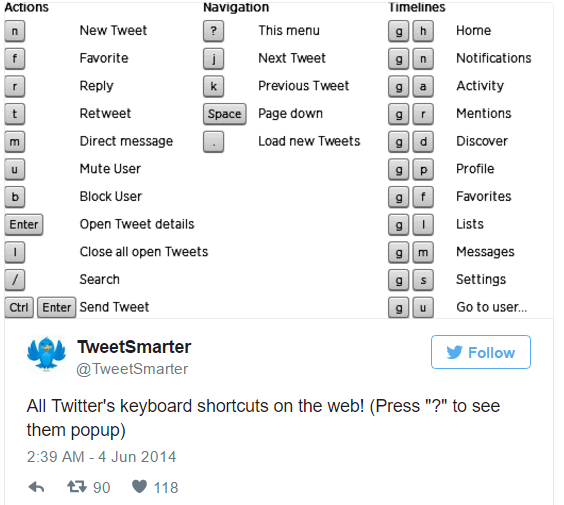 Never fear, there’s a simple, but little known, way to log out of your profile remotely. Navigate to “settings” using the drop-down in the right hand corner of your screen, then “security”, then “when you’re logged in”. From this screen, you will be able to close an open session, on whichever device it’s still running on. There are many fun tricks and tips, or easter eggs, to be found on YouTube. For instance, the ability to play arcade games within viewer, but there is also a trick that is genuinely useful: playing videos in slow motion. It’s easier to spot yourself in the background of a TV vox pop that way. It’s incredibly simple: just hold down the space bar, and the video will start playing at a slower speed, perfect when it comes to grabbing the perfect screenshot of a particular moment (and here’s how to do that on Mac and PC). You’re welcome. However what you often really want is to mute someone from reading your tweets. Here there’s an unofficial option that can help, it’s known as “the soft block”. This is a sly means of forcing a person to unfollow you by blocking and immediately unblocking them. Once they are unfollowing, your tweets and retweets will no longer appear in their timeline. Also: remember to always place a full stop before @-mention when tweeting something you want visible in your timeline, and not just another’s mention stream. So, that all for you tech lovers. Hope you enjoyed the article by knowing “20 Best and Useful Internet Hacks”. For any suggestions or help comments are most welcome, and thanks for your valuable time !! WhatsApp Unknown tricks 2016: According to WhatsApp, there are two types of people in this world: those who leave their Read Receipts on and those who decide to disable the feature. The Read Receipt was one of the biggest controversial topics when Apple first introduced it in iOS 5. Many people were annoyed, and some were downright enraged with this new addition to the iPhone. The birth of the Read Receipt was inconspicuous enough. It started out in our work email, with easy opt-out options, and was meant to slightly increase productivity. Today, the Read Receipt is everywhere, oftentimes as a default, poking its devilish head into all parts of our life, from the mundane to the professional to the very personal. 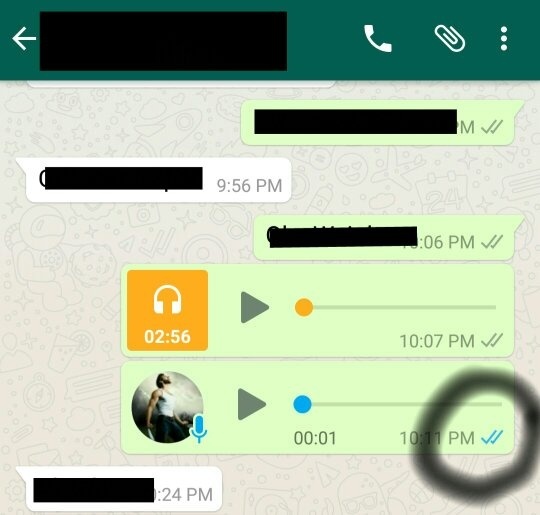 For any message that you send on WhatsApp, you will be able to see a Message info screen, displaying the details of when your message was delivered, read or played by the recipient(s). Of course, if you’d rather banish the blue ticks from your life altogether, you can turn off read receipts permanently on your iPhone or Android device with a few taps. Read receipts is a privacy tool in Account settings for better use of WhatsApp users. 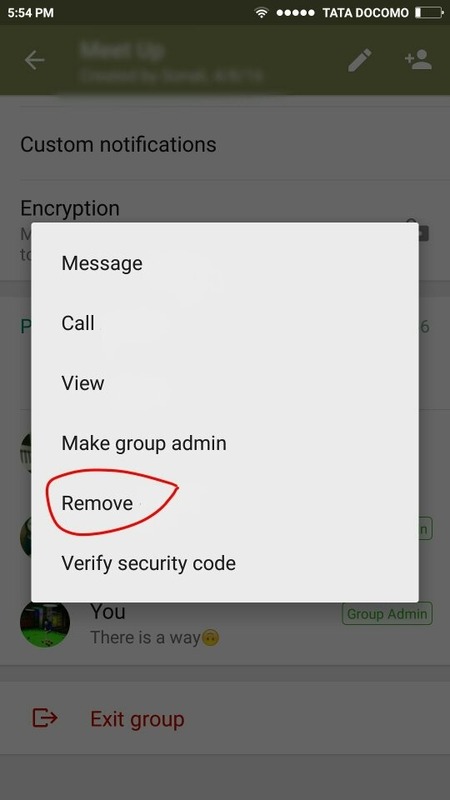 It can be turned on and off so that you can adjust how you want WhatsApp to function with the messages you send. If you toggle the feature off, then the message status will always say “Delivered,” even if you’ve read the messages in the chat. If you toggle it to “On,” then the message status will update to “Read” when you’ve seen the message. Decide which one to use based on what level of privacy you want. 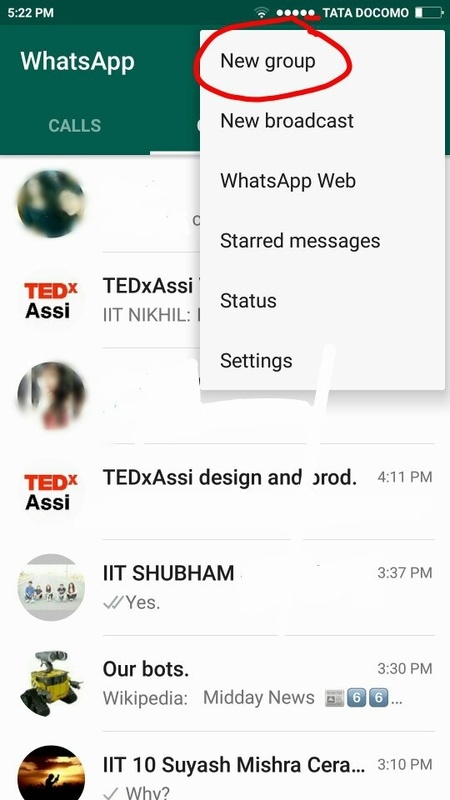 The selection you make applies to every message conversation in the app; you can’t adjust settings for individual users. 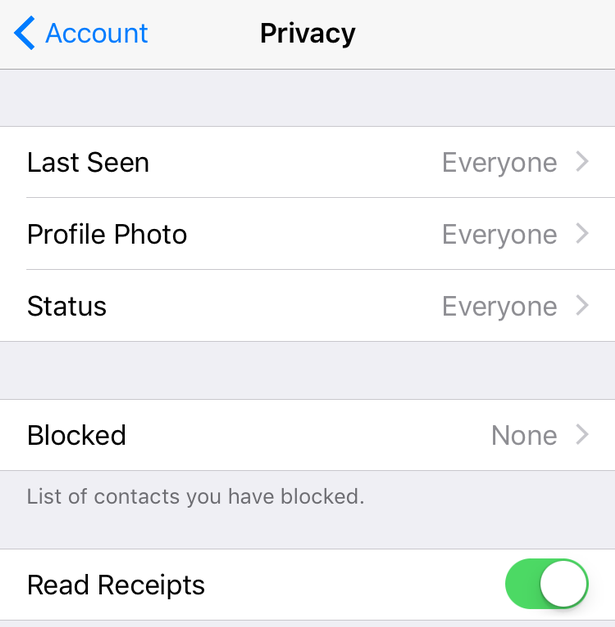 To opt out of the Read Receipts feature, go to Settings > Account > Privacy and uncheck Read Receipts. 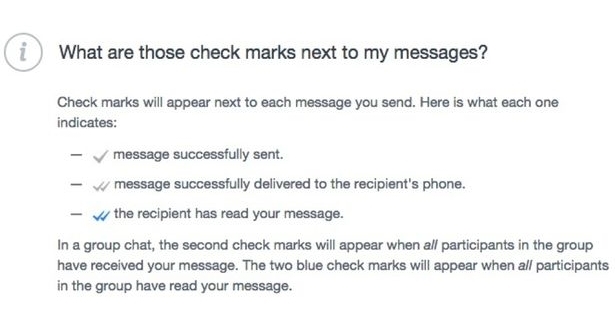 Just remember that, if you do this, you will not be able to see read receipts from your friends either, so you won’t know whether they have read your messages – but perhaps that’s a mercy. Note: This will not disable the Read Receipts for Group Chats or Play Receipts for Voice Messages. There is no way to turn off these features. #1. A trick to know whether a person has read your messages or not: if he/she has turned off read recipients in their WhatsApp. If you’ve sent an important text message and the recipient is taking ages to reply, you might get the urge to find out whether that recipient has read it and is simply ignoring you (rude!) or whether they’re actually really busy and haven’t checked their phone yet (forgiven). Here, we show you how to tell when someone has seen your message on iOS and Android. Has your friend turned off his read receipts ? Don’t you know whether you are being ignored or they haven’t seen your text ? Whenever you text anyone who’s read receipts is turned off, just send a voice message of 1 second along with your other messages . Whenever they’ll see your texts you will be able to see blue ticks beside your voice message. It only works if the other person has listened to the voice message. (The probability is that another person would listen to the voice is high). Has your close friend blocked you or turned off read recipients and you still want to text them. Here is the self-developed technique. I guess it’s the bug of the software which allows this message transmission. Click on the top rightmost button. 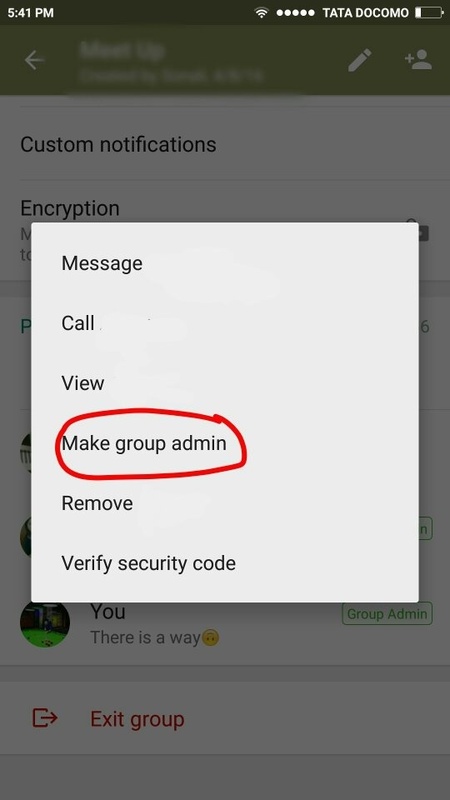 Tap on create a new group. Add your mutual friend in the group( The one who is in the contact with the person who has blocked you or who has turned off red recipients). Then make the mutual friend as the admin of the group. 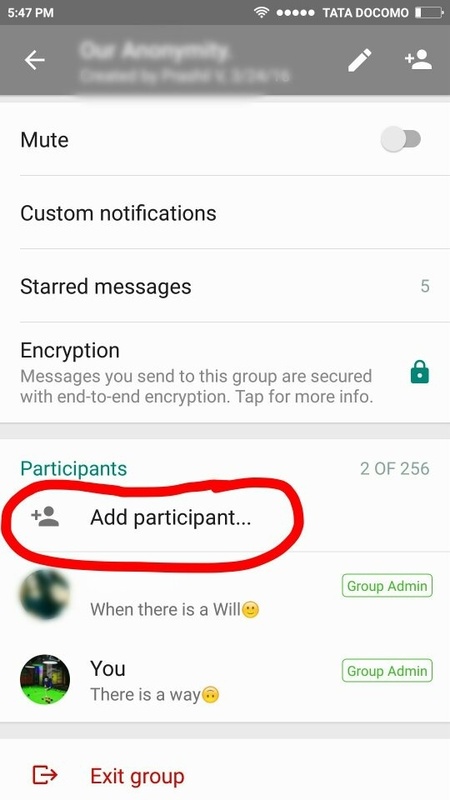 Tell them to add the special friend (who has blocked you or turned off read recipients) into the group. Remove your mutual friend from the group. Now pour your heart out. And apologize from the deepest part of your soul and pray to god that no such situations arise ever. 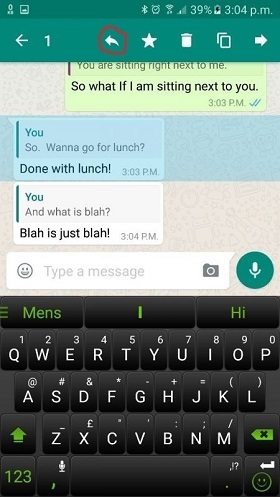 (*What actually happens here is that when we message in the group even if the other person has blocked us they get the message and even the read receipts can be seen in the group even if it is switched off.). 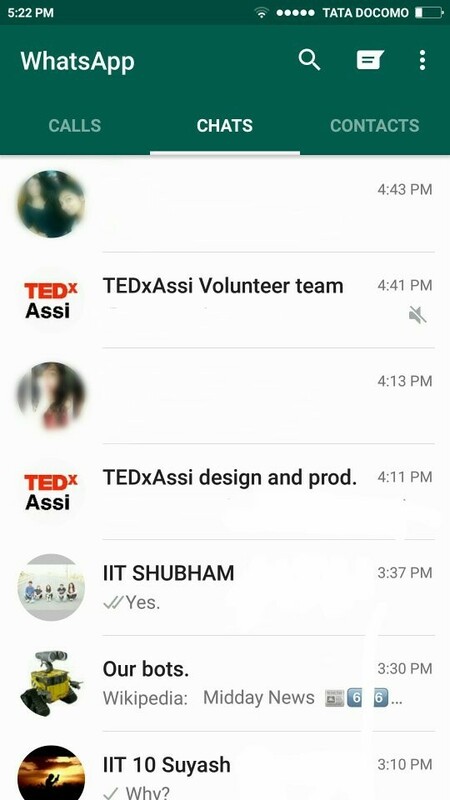 The quote feature comes handy when you are in a group chat.You can quote somebody’s message when replying to them, it makes it easier for all the participants in the group to know whom you are actually referring to. This feature also works in one-on-one chats, where you can reply back while referring to some old message in the list. If you are on a beta version, long press the message of your buddy, you will see an arrow pointing to the left. You can see the arrow in the below picture which is circled in red. click on that and write that “this in the new cool feature you got to know on quora”. You can hijack WhatsApp of others that too in a legal way. Yes, you can check messages of your GF/BF or other friends, that too secretly. Might be most of you are aware of it, but for those who don’t Its a Million Dollar Trick . No need to root your phone, no need to change mac, no need to go anywhere except you just need WhatsApp of target phone that may be your friend or any well known person. The best part is that it will be done in barely 10-30 seconds, based on your precision & speed. 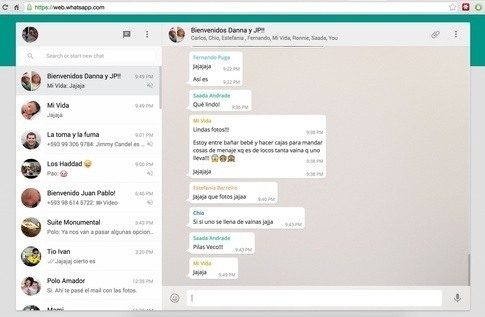 Take your target phone open his WhatsApp, then while on the main screen of chats , on the TOP RIGHT CORNER, you will see three smalls point like colon sign for the option. 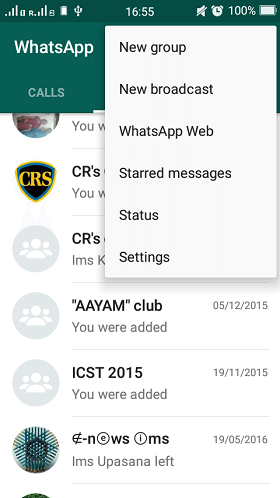 There you will get an option for WHATSAPP WEB, click it,as soon as you click a QR code scanner will buzz up. It’s done you can see all details of your target’s phone on your desktop. Use carefully So that your target should not get any hint that anyone hijacked his WhatsApp, Avoid reading incoming message first by your own. It will work only when the Internet is working on your target’s phone. So, that all for you WhatsApp lover’s today. 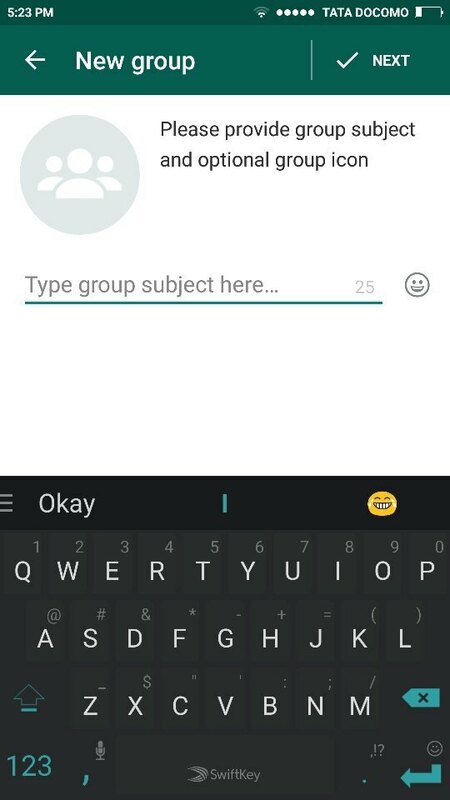 Hope you enjoyed the article by knowing “ New Tricks and Techniques in WhatsApp 2016“. Need help? Comments are most welcome. Are you looking for a job, internship or applying for admission in a college, you need to to be capable enough to send professional emails in a precise manner. Email is one of the best means of communication for handling most of the business dealings online. Most of the organizations prefer this communication tool in order to get their work done. It is most important to write emails clearly and precisely as we send and receive a huge volume of emails which are often misinterpreted. It is always suggested that emails must be simple and short without any lengthy conversations. Writing emails that are short and to-the-point will eventually lessen the time you spend on particular email and make you more prolific. One of the most important things is that writing in a clear way is a skill. If you are probably not highly skilled in writing email or any other formal document, you need to be very cautious and work at it. By writing emails much clear, you’ll become identified as someone who grasps what the other person requires and who gets things done so that this could be very beneficial for the prospects of growth in your career. Despite emails usually aren’t as formal as letters, however, they need to be a bit professional to bestow a great perception of your company and you as well. So, you can follow these best tips and tricks to enhance you email writing skills at times when you’re writing an e-mail for business or some job-related communication. Once after applying these tips while writing an email, it will definitely give your email a professional touch. Generally, professional e-mails need to be crisp and to-the-point and should include only relevant information. Just have a look at the tips and tricks! Is this email really necessary? Why am I sending this email? What do I need from the recipient? If you don’t have a proper idea about these questions, then it is worthless of sending an email. It is truly a waste of your time doing mutual communication by sending emails without having a clear picture of what you need. 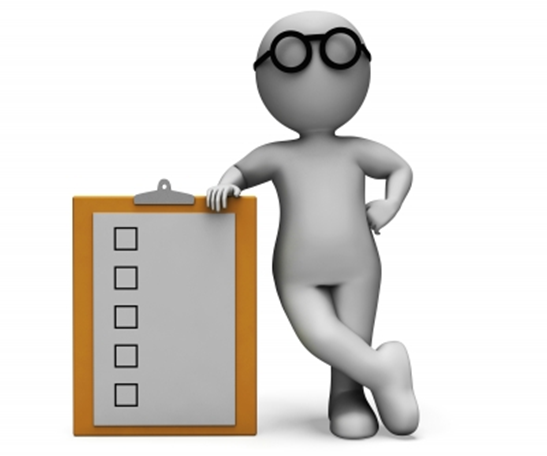 So, you have to make sure that you’re completely clear about your requirements and objectives of your business deal. 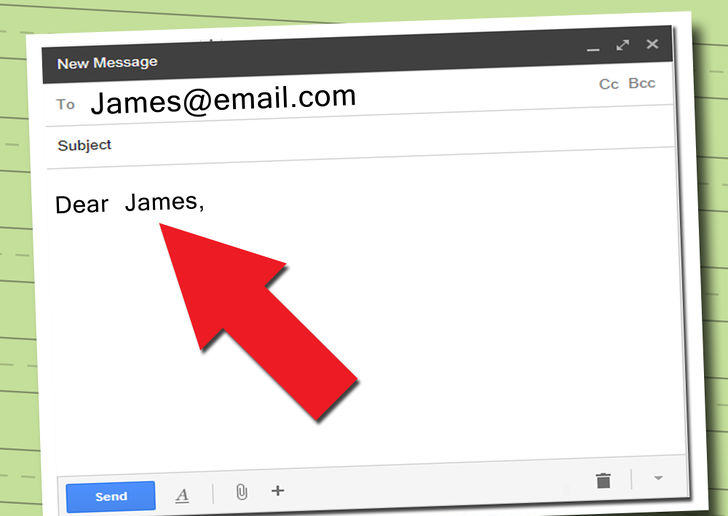 Always begin your email with a greeting, such as “Dear Wilson”. If your relationship with the recipient is formal you can use address them with their family name (like “Dear Mrs. Henry”). If the relationship is more informal, you can simply say, “Hi Mary”. If you don’t know the name of the person you are writing to, simply use: “To whom it may concern” or “Dear Sir/Madam”. Many times, people ask various questions in an email, which drives to a delayed response. Emails are not the likewise as a business conference. With business meetings, the more schedule matters you work through, the more productive the conference. In the case of emails, this will be totally opposite. Instead of asking too many questions in just one email, simply have one point per email. The short you include in your emails, the better you can communicate. Hence, it’s a good idea to follow the “one thing” rule. Make sure that you always send an email regarding one business deal or some other project. So, make each email you send about one thing only. If you want to communicate about another project, do write another email. It not only helps make the message simple to digest and makes it more flexible for the recipient to process. Internet users are often in a rush to read and get over it, so always have this mindset when writing an email. Never use a long word where a short one will do. This will be relevant in most cases especially when writing emails. Short words often confer reverence for your reader. By using short and precise words, you’ve done the hard work of making your message straightforward and pretty much easy to understand. The same is valid for short sentences and passages. Avoid writing huge blocks of text if you want your email to be clear and easily understood. Always try to keep your sentences as short as possible. Once you’ve followed your standard email structure, simply trim every sentence down to be as short as it can be. Don’t try to be Being too creative and over-innovative. Creativity and innovation are not at all required while writing emails. Just use standard formats and conventional fonts for professional e-mails. Using different colors of various font sizes in one mail is just going to portray you as a beginner. You can manifest your identity but you can do that through your content and not through the wrapping. One of the best tips for better, more professional emails is to bullet-point the relevant details in the email. This could help people to be able to instantly scan an email to get to the purpose of it. You need to place quality information with bullet points so that your email will appear much more effective and professional. There is a huge contrast between sending a random text to a friend and sending a formal mail. In informal chats, we often use smileys and emoticons in order to express our feeling right at that moment. For any professional e-mail, this kind of composition may be considered very improper. You will absolutely not place a smiley face in the subject of your e-mail when applying for a job. One significant tip when writing professional e-mails is that you should let emotions direct your writing. Before heading to write an email, you just need to calm down regardless of your feeling whether you are glad, sad, frustrated or annoyed. Before hitting a Send button. double check your writing. As a professional person, you need to leave a lasting opinion on a recipient and one of the vital points of knowing how to write professional emails is how to sign off. Your signature indicates your identity and can be seen in every message. If you are looking for employment, it is essential to include your credentials like name, contact details and alternative phone numbers. This is all part of portraying yourself as a professional and discerning common area with other professionals. This is the most important element while writing a professional email. Do check your standard of grammar and spellings when writing a professional e-mail. Spelling and grammar errors can represent you as a poor communicator. Remember, the first impression is always the best and final impression. Imagine yourself as a recruiting manager or HR and think that would you hire someone with inadequate language skills? Absolutely not! So proof-read your email at least twice to check for errors after writing it. 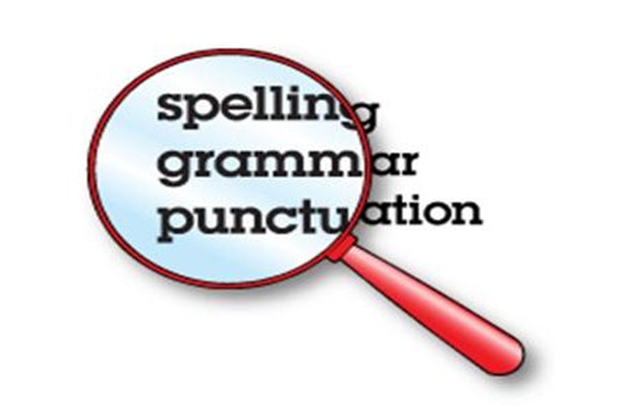 There are bounteous online grammar and spell checking tools available on the web that help you rectify your typos while writing. Make use of such tools to gain a good impression from your recipient. These are the tips and tricks that you must follow while writing a professional email to any job application, business conversation or any other official project. These are the most important points that I have mentioned in the article that everyone need to remember before heading to write a professional email. 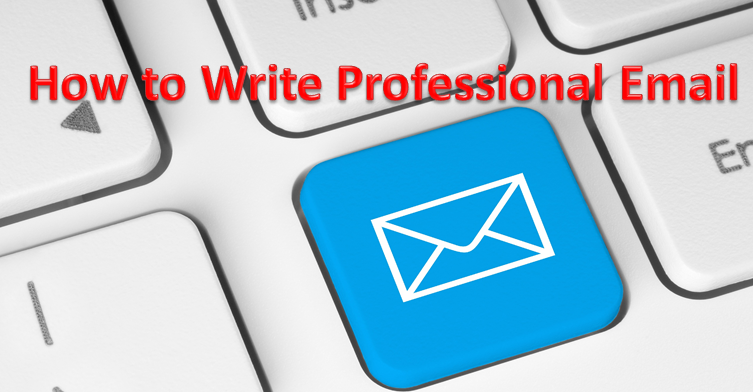 Hope this article helps you in the best way to write a professional email in a more professional way. This comprehensive guide Keywords is a complete work that I have done with my team, which aims to guide you step by step through these tips, mistakes, tools and other interesting aspects to help you to choose the Top keywords to position in Google. If you follow the recommendations we give you in this guide, you can squeeze the most of your Content Strategy and you can position yourself on Google with the most important keywords in your niche. All the content strategy must be begin with the choice of topic you want to write about and conduct a basic study of keywords . Today, such a study is available to anyone because we have very simple tools to use and provide us with hundreds of possibilities for us to choose the best keywords . The theme where we want to position. The audience that we want to go. This keyword searches targeting a conversion, either a direct sale or get a subscription. This keyword you are looking to give visibility to the business and improve its brand image. In both cases, we always try to choose keywords that generate quality traffic to our website. What is and how to calculate the degree of difficulty of a keyword? The degree of difficulty of a keyword or also known as Keyword Difficulty is the level of complexity that has a keyword to bring it to the top positions of Google search engine. It is calculated by considering the authority of the domains that appear in the better position and also takes the number of web pages that attempt to position themselves for that particular term. For this I recommend to use Google Adwords planner, you can get hundreds of keywords from 5-10 base words. First and basic step to find the best keywords on Google. Analyze the keywords that are getting more web traffic similar to yours and add them to your list of words pages. You should try to reduce that list to 30 or 40 keywords that will base much of your Content Strategy. Select 4 Keywords that are the pillars of your list of words and make the aim of achieving the Top 1 of Google . Try to reach small goals and gradually you can go “raising the bar” and try to position yourself with more complex and difficult keywords. Do not forget the old post that missed Olympus to reach the first page of Google or simply did not generate web traffic by a poor choice of keyword, so take a few minutes to change the keyword and thus try to position again that old article. Monitoring keywords is very useful to measure the results of our actions on our web positioning. We can also see how it affects the Google algorithm updates . This is the most common error and occurs for the simple reason that a Blogger or any other professional does not have to have knowledge of SEO and knowing how to choose the best keywords to get thousands of hits per month through Google, it is for that reason it is very important not to err in the choice of these keywords. Do not be put off by the desire to appear in the Google search engine with a large number of terms, and thus devote most of your efforts to generate and create content because this is a mistake, you have to choose the niches in which position you want, and in most of the cases a few pages are reduced within your website. Not because they cover more topics in your blog or website will better position in Google, we should always look for consistency and coherence of content and preferably include one or two areas and do well to make a very fuzzy strategy where “many sticks touch” . There are those who think to get thousands of hits per month on a blog, must publish the content constantly, but that’s not true, it is preferable to publish a post a week and that this is “milk” to publish every day. It certainly a big mistake because analyzing competition is a competitive advantage because in seconds can detect very powerful keywords and whether we would position ourselves in some of them. Otherwise we monitor the positions of our web pages we’ll go blind and may not know whether the work we are doing is well focused or what aspects should be improved. We must always keep our feet on the ground when choosing the keywords in which we position ourselves, and we should try to position terms with large variability “longtail” so that we give so many combinations and is easier to reach the TOP 10 in Google and get web traffic. There was a time when the success of a website is measured according to their positions. But times have changed, and today many SEO specialists cast doubt worthwhile to continue monitoring the positions of the search engine. Although anyone could consider this metric is outdated and is debatable, I am sure that the positions are incredibly important to help achieve better results in SEO factor, and no one can or should ignore. And this is the reason. Promoting a website is a complex process, and many of the activities contribute to its success or its failure-not only SEO but also PPC, content strategy, social networks, etc. Conversions and engagement can give you a general idea of ​​how your site performs, as are positions of keywords that give you the opportunity to accurately assess your work on SEO. If you combine positions with data from organic traffic, you can get information about the potential of your traffic for each keyword or group of keywords. For example: if you see a particular keyword that is in position 5 of the search engine brings you, say, 60 views, you can estimate approximately how many visits have when in the second or first position. This information is essential for planning your budget and prioritize time to dedicate to do SEO. Another useful tip is that the position can help you predict traffic flow even before it occurs. Imagine you start your SEO campaign, you write informative content, you optimize the page. But traffic does not come suddenly, and not easy to understand if your efforts have paid off. If you monitor your objective steadily keywords, you can see how your position is increasing gradually growing, for example, from position 60 to 30. And that’s where you realize that you are gaining ground. While organic traffic is a good thing, you should always think of conversion. If you monitor accurately the positions of your keywords and analyze the number of conversions that bring you, you’ll realize that that particular keyword is in a higher position does not mean that bring more sales, despite being directing more traffic. This indicates that you’ve taken full advantage of this keyword, and although the follow pushing up, do not bring more benefits. It’s time for you to concentrate on other keywords, or are looking for new variations and long tail keywords. Converting the visitors into customers is the main task of most marketing campaigns. But still do not forget those who are early in their search for products or services as you can offer. Improve your position in the search engines means actually increase your brand image and visibility. Therefore, when you track your positions you can see how they grow the authority of your brand and trust. Reveals an effective keywords for which you should position yourself. The positions of competition can offer you fresh ideas on keywords, but you can also discover new ways to increase your visibility while you monitor your own positions. One of the most valuable benefits of tracking is to find positions called “ripe fruit”. These are keywords that are in their crucial positions (close to the first 3 positions or the first page of results). Focus on these words and you will get better results than working with keywords that have lower positions. Track steadily the position of your keywords and see that every keyword is in a good way to optimize your PPC budget. If any of the keywords you use in your PPC campaign are showing very good results in organic positioning, why not reduce your PPC budget for these words and concentrate on those that do not work so well in the organic positioning? This will help you not to spend money and meet some new keywords that can bring you sales in the future. The ranking keywords is a powerful indicator of the health of your site. When things go wrong, either by a problem with SEO, a technical problem or the penalty of a search engine, you will notice forthwith by the change in position. A significant drop in positions of some keywords is safer than any other metric alert. The major source of web traffic from Google search engine comes from a few keywords or what is the same thing from few pages of a website. This theory what you want is to show that your Content Strategy is effective and fruitful, must detect and work those 4 keywords, which will be the pillar that supports web traffic to your website. This theory tells us is that it is more effective to focus your Marketing Strategy and on some specific content, in the center instead of on a strategy of quantity. Once you have identified what are the four keywords where you want to position, you have to do is a strategy that works and boost the SEO of these four keywords, and thus your website traffic will increase significantly. This is all about the Tools, Tips and Mistakes to find the Best keywords on Google. If you have any doubts regarding the Keywords, let us know in your comments. Whenever there is a possibility we will answer your questions.